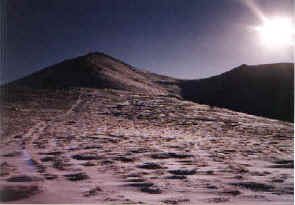 Bynack More (1090m) sits apart from the main Cairn Gorm plateau, the long, steep-sided gash of Strath Nethy providing a gulf between the two. This delightful peak is known both as Ben Bynack and Caiplich, but most just refer to it as Bynack More. The most popular approach - and the one we take for this route - is from Loch Morlich up through the Ryvoan Pass. 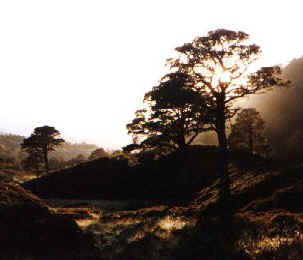 A well graded forest track, which starts behind Glenmore Lodge and follows the course of the Allt na Feith Duibhe upstream, breaks the legs in gently as it wanders through a peaceful forest of gnarled old Scots Pine trees past the crystal clear waters of Lochan Uaine towards the MBA-maintained bothy at Ryvoan, in the shadow of Meall a'Bhuachaille. Before you reach this tiny shelter, however, the track forks and the route to Bynack More breaks right, curving round the northern flank of Creag nan Gall. The way passes above Loch a'Garbh-choire and, about a mile from the junction, reaches Bynack Stable, an old tin shed which provides a drafty shelter should you find yourself stranded here at the mercy of the elements. The path hops over the gurgling River Nethy and starts to climb in a south east direction over the lower shoulder of Bynack More. It rises to a height of around 790 metres, before starting a descent into Coire Odhar. 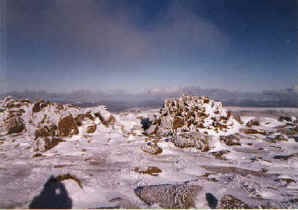 Leave it at this high point and strike off to the right, on to the 818 metre high knoll to the south of Bynack More. From here, head almost due south and the final mile of ascent begins, rising up steeply to finally bring you out at the summit cairn. Views from the top are magnificent. Over to the east is Cairn Gorm and to the south, beyond neighbouring A'Choinneach, is Beinn Mheadhoin. You have several options to return home. The simplest choice is to simply retrace your steps down to Bynack Stable and then on through Ryvoan Pass. Alternatively, you can descend north west over craggy Bynack Beag, dropping into Strath Nethy and follow this north to Bynack Stable. Another option is to descend into Strath Nethy and then climb out (it's fairly steep!) and walk round to the ski car park at Coire na Ciste, then follow the road back down to Loch Morlich. The Coire na Cistle car park also provides an alternative start point and, although closer to Bynack More, the terrain over which you will have to trek is rougher. Map OS Landranger 1:50,000 sheet 36 or Harveys Cairn Gorm. Start/parking End of the public road behind Glen More Lodge. GR: 990096. There's space for several cars at the end of the road. Grading A fairly straightforward ascent for fit hillwalkers.